1. Quit buying everything | Ask yourself, "will this product work for me?" and "Do I really need this?" This is wonderful, thanks for the reminders. really? I always thought sales people should know what they are selling .. otherwise why hire them? I've made a mental note! sound advice - love every point here! i'm definitely guilty of forgetting point 1 :( and have been trying hard to do more of point 5, 6 and 7!! I agree with most of the points here, but I have no shame in being a high end brand snob. At the end of day, makeup is makeup and we use it to enhance our lives. Part of that experience for me is using luxurious brands and I wouldn't judge someone on what they choose to spend their own money on. It doesn't necessarily mean premium brands are better than the drugstore counterparts, but I'm going to spend my money on brands I love and enjoy using. I think for this reason, I'm a lot wiser with my money too. Sales people are informative most of the time, but it's pretty obvious when they're just trying to get more money out of you. I've discovered some genuinely amazing products through them before, but these days, I'm not so much of a pushover. I've learnt to put my foot down and just tell them I'm after the one thing, and that's that! i am just starting to learn to look at the ingredients. it is a process but I think it is worth it. Pay more for a pretty box, and that goes for a lot beauty products. Oh no, I would TOTALLY agree with that; if there are two products that work exactly the same but one looks rather lovely but costs more and the other is cheaper and looks cheaper, if you can afford to pick the more expensive version then why not? That's your choice. I know I sometimes buy things because aesthetically they are beautiful. What I'm talking about when I say 'brand snob' is ignoring brands simply because they are not the most popular brands. I see people only buying MAC and NARS, Christian Dior and YSL, Origins and Aesop simply because that's what everyone else buys. I see a lot of brand snobbery simply based on what is most popular and whether they are classified as "high end" or not. But I am also talking about ingredients; I've purchased products from popular brands because everyone says how amazing they are.. but they turned out to be rather awful and, once I gave other lesser known brands a chance (based on a little research to seek out products tailored to my needs rather than hyped products), I realised there are other options out there. For example, the Origins Ginzing Moisturiser didn't work for me but everyone loves it.. I've since found a lesser known brand (at a inconsequentially lower price point) that offers and amazing moisturiser. What's really important here is not picking a brand or product simply because everyone else is buying or whether it falls into the high end or low end bracket it but rather because the products works well. What's really important is whether a product works the way you want it to, it doesn't really matter if it costs £1 or £100 - so long as it works in the way you want it to. I see a lot of people only buying products because they cost a lot of money and because they are "high end" - that, in my opinion, is a silly way to shop. What even constitutes "high end" anyway? Price tags mean nothing if a product is bad and what about all the brands that don't fall into the "high end" and "drugstore" categories? I've found a lot of products recently that are amazing, vary on price (from low to high), and are relatively unknown in the more popular end of the beauty blogging scene. I was buying too much; I think it's best to buy fewer items that work really well. I used to be.. and then I realised, what even constitutes "high end" anyway? There are a whole load of brands who don't even fall into the "drugstore" and "high end" categories, which vary in price. I also see the same "high end" brand names mentioned all over the place and a lot of those brands produce rather poor quality products for extortionate prices. What matters most to me is whether something works and the ingredients it contains. I don't have a problem buying expensive products because they look nice.. as long as they work as well as they promise. In retail, most of the time sales assistants learn their product knowledge after they have been hired. They might know what they are selling, but people make mistakes and can't possibly know everything. I used to work in retail, in an entertainment store, and while I knew a lot about the job I couldn't possibly be expected to know every single musician and band in existence. It's the same with beauty counter assistants, they might know a lot about the products but there are always going to be some flaws and lack of knowledge on certain issues. Absolutely. I might love the sound of all the products I read about.. but I don't need to buy them all! Since moving apartments and my work space being downstairs, I barely wear make-up unless I feel like it. My skin has been even better than ever. I think some people just don't get on with 'natural' or 'organic ingredients, although a lot of brands tout themselves are 'natural/organic' but their ingredients say otherwise.. I absolutely love pure coconut oil as a cleanser and I've achieved great results with almond oil and argan oil for my hair and skin. Yes, that's definitely true! It's incredible how much of an impact blogging and YouTube has had on the beauty industry and to be honest, I wouldn't even know half the brands I know now because of it! I wonder what my makeup collection or skincare routine would even look like if I never got into YouTube. It's introduced me to some incredible products that's done wonders for my skin and it's even developed as a passion of mine, but it's definitely apparent that people like to use what's popular and used by others. I know I'm guilty of that, but I also like to read reviews on MakeupAlley to get a more varied opinion. I'm beginning to become a little jaded with blogging as I see people blog about the same products. Instead of people talking about what they really love, it's just beginning to all feel like a big advertisement. It's a bit sad as it's something I used to really, really love, but I'm beginning to me a bit more conscious of it and what I'm spending my money on. I'll admit, I've never been one to really look at ingredients. I don't have particularly sensitive skin, though it has made me weary of Marie Badescu products after my skin became really irritated by a face mask. I've generally been really impressed with Origins products even if they aren't as natural or organic as they claim to be. I'd love to see a blog post on some of the lesser known brands you've discovered and how you did so! Beauty blogging, at the end of the day, has essentially become another form of advertising and I guess we just have to accept that certain brands are going to be more hyped up than others because of this. It hasn't stopped me from loving these brands and the products I've bought because of it, but I've definitely become a lot more aware of what is basically trying to be sold to me. I do ask myself, "Do I need this?" a lot more now and I've only bought two beauty products in the past 2-3 months, which I am so proud of! I don't need another detox mask in my routine when I already have one, five exfoliating toners and ten orangey red lipsticks! You can never keep up with the latest and greatest without becoming broke or owning too much for your ONE face to handle, so I've stopped trying. The first tip is the most important in my opinion. 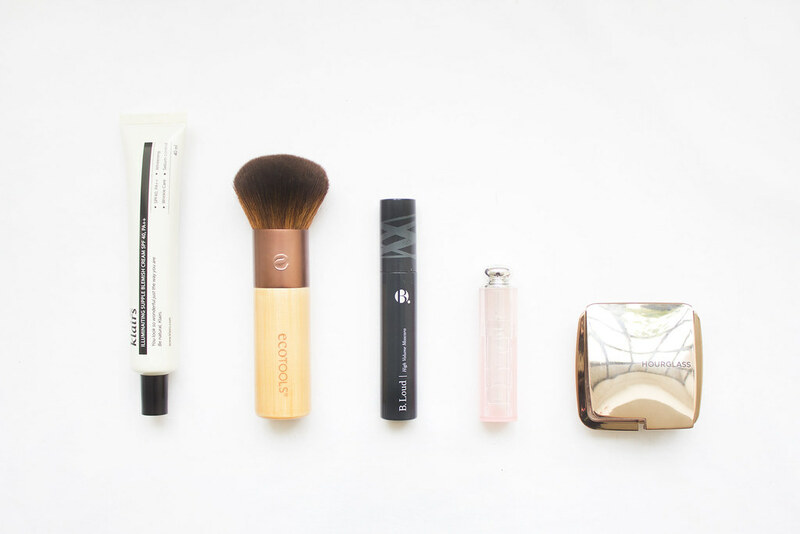 To have a minimal yet versatile makeup bag is the goal. Great tips, on weekends I avoid wearing make up and it's one of the first things I do when I come home. I hate my skin feeling clogged with make up when it doesn't need to be. I am REALLY into this post. I totally agree with everything you said. I haven't bought many beauty products in the past few months. I have bought a few items which I have wanted for months, but in reality, I only have one face and have enough products to last me a life time. As for the sales assistant, I agree too. Even though I do work for a well known skincare brand (which you mentioned in the post), I think I'm one of the few who actually care about peoples skin. I never ever force people to buy the products, 9 times out 10 I will make people go away with a sample to try it for a week because not everything works. Plus, not everyone needs the Parsley Seed Masque, it ain't that good. 1 - makeup goes off over time, I really don't need 5 bases! 5 - looking at ingredients in what we wear and eat should be 2nd nature. 7 - my favourite step, the moment I step through the door the makeup comes off. great post! you're so right, it's really easy to get caught up in the hype of a new product and want it because everyone is talking about it, even if you have no need for it and lots of other products you need to use up already. when i first got really into beauty i just wanted to try everything so i would have lots of options and build up a decent sized collection so i could get a feel for different finishes and what does and doesn't work for me, but now that i've got a better idea of everything i'm a lot pickier about what i spend my money on, mostly because there are absolutely no beauty products that i actually NEED, everything is just a want so i've become a lot more discerning about what i spend my money on and whose opinions i trust. Sorry to add to a two week old comment thread, but I was looking at the ingredients in Bumble & Bumble and Ojon hair products today and found it shocking how much they charge for products containing cheap sulphates! I hate the argument for and against sulfates; there is nothing wrong with SLS aside from the fact that they work for some people and don't work for others. Sure, your shampoo doesn't need to foam.. but there are loads of things in our lives that we don't NEED but we use anyway because they feel good/we like them/they work/it's cheaper/whatever. Okay, I should've explained more that I didn't solely mean the sulphates, I also found a lot of ingredients that I know feature in my cheaper products. I can't use sulphates personally, as they aggravate me a lot, and in my opinion I don't think that the more expensive brands *need* to use them, when other brands have found more gentle ingredients, and don't need to resort to using so many moisturising ingredients to rebalance the hair, if that makes any sense at all?